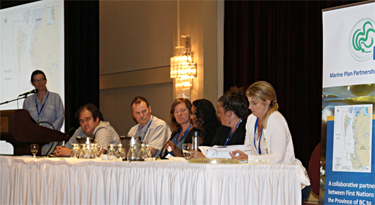 Jo Smith, Dallas Smith, Rich Chapple, Kristin Worsley, Maya Paul, Cathy Rigg and Karen Topelko respond to questions following their presentations during the MaPP session at the IMCC4. Photo credit: Ian Byington. A delegation from MaPP presented a two-hour session at the fourth International Marine Conservation Congress (IMCC4) held in St. John’s, Newfoundland from July 30 to Aug. 3, 2016. The biannual meeting drew together 690 marine conservation professionals and students from 50 countries who exchanged information and ideas related to the overall conference theme, making marine science meaningful. The session, Marine planning in Canada: Results and lessons from the Marine Plan Partnership for the North Pacific Coast (MaPP), was chaired by former MaPP science coordinator, Jo Smith, now the marine spatial planning science manager with The Nature Conservancy, and featured six presentations and a panel discussion to an audience of 125 people. Dallas Smith, then President of the Nanwakolas Council, spoke about how the MaPP planning process integrated First Nations culture and governance with science and policy. Kristin Worsley, manager, Marine and Coastal Resources, B.C. Ministry of Forests, Lands and Natural Resource Operations, described zoning in a multi-jurisdictional marine space – a spatial framework for integrated marine resource management in Canada’s North Pacific Coast. Rich Chapple, President of the Central Coast Indigenous Resources Alliance, addressed the role of traditional and place-based knowledge in marine planning on the Central Coast. Maya Paul, cumulative effects coordinator with the North Coast-Skeena First Nations Stewardship Society, spoke about planning for the North Coast and navigating marine management amidst a surge in industrial development. Cathy Rigg, socio-economic planner with the Council of the Haida Nation, described how the Haida Gwaii marine planning process utilized community connections and cross-scale linkages. Karen Topelko, marine planner, Marine and Coastal Resources, B.C. Ministry of Forests, Lands and Natural Resource Operations, addressed successes, lessons learned and implementing the MaPP marine plans and reflected on the marine spatial planning process in B.C. The presentations were followed by a 30-minute question and answer session. Audience members posed questions about the importance of relationship-building and developing trust with government agencies, about traditional methods of resource management by First Nations before colonization, about federal government involvement in the marine planning process, and about how out-of-scope sectors were addressed in the marine plans. Members of the audience also viewed display copies of the marine plans and received copies of the plan overviews. That evening, Green Fire Productions aired a video, Great Bear Sea – First Nations & British Columbia Partner on Marine Plans, to a standing room-only crowd of 120 people. Following the screening, producer Karen Anspacher-Meyer moderated a question and answer session with a panel of MaPP participants including Dallas Smith; Russ Jones, manager, Marine Planning with the Council of the Haida Nation; and Karen Topelko. Topics addressed included the importance of relationship-building, advice for the new marine planning process in Hudson Bay, how community and stakeholder support for the plans was gained and the next steps for MaPP. The MaPP delegation was pleased to have the opportunity to present to colleagues about marine planning in B.C. They noted the substantial interest generated by their presentations, references to MaPP heard in other presentations from B.C. delegates, and they look forward to continued contact with others doing similar marine planning work around the world.